Every now and then when you are fabricating a piece or polishing a casting, a hole or hollow will pop up that needs to be filed and smoothed. You can usually get at it using a bur and abrasive tools in your flex-shaft. But when you just can’t reach the hole, an old-fashioned tool called a riffle file comes in handy. 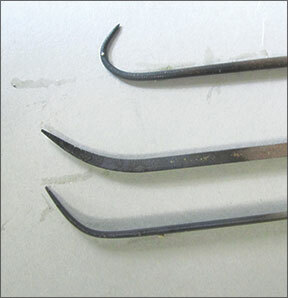 Featuring various bent and curved shapes, these files fit into odd internal surface profiles. They were used extensively in the past for working on carved and chased steel dies intended for stamping out jewelry and other metal shapes. Years ago you could find dozens of curves and shapes, but today the tools are difficult to come by, so your best bet is to make your own. The easiest way to create a riffle file is by converting an existing needle file. You simply heat the area to be curved and bend it gently without kinking it. The entire process outlined here takes less than 5 minutes. 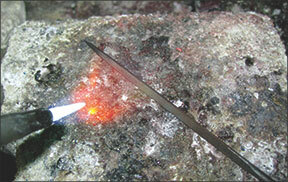 Get a firebrick or hard surface onto which you can press the end of the file to bend it while it is hot. Because of the heat required to bend the file, resulting oxidation could damage the teeth. To prevent this, rub bar soap onto the part of the steel will be heated. You can do this prior to or while you begin to heat the file. 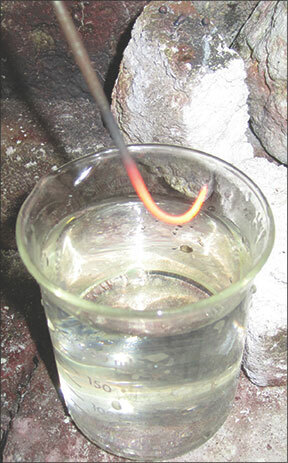 Using a torch, heat the area that you want to bend until it is bright orange. Press the file onto the firebrick and bend it as uniformly as possible. It may take several tries of heating the file to get the desired bend. You can also use pliers to bend the hot steel. When you have the desired shape, you must uniformly harden the steel, and possibly temper it. In the example shown here, the only part of the file that needs to be hard is the newly curved area. In preparation for heat-treating, rub bar soap on the curved part of the file. Heat that portion of the file to a bright orange and quench it quickly in water. The heat-treated part of the file will be hard and extremely brittle. If you drop it or use it to pry at something, it will snap. This shouldn’t be a problem if you plan to use it only for smoothing holes, but if you want to use the file with any more force, you must temper it. To do so, heat the file to between 310?F and 350?F/154?C and 177?C. It’s as simple as putting it into the oven at this temperature and then cooling it. 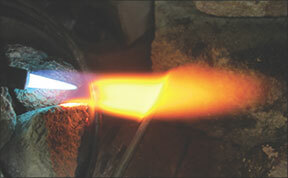 Some blacksmiths use a deep fryer, setting the temperature precisely for this process.